Life lately, re-considering my place in the blogosphere & Remembering why — sophie rosie. I feel like I should explain why things have been so quiet on my blog for the last 6 months or so, but the truth is, life has just been happening. Mostly, it’s been work. I started a new job back in September which I absolutely love, but it’s keeping me incredibly busy. I work in the most supportive, fun and sometimes spectacularly inappropriate team, but I wouldn’t have it any other way. Moving back into this team after a year out in London - well, it just felt like coming home in more ways than one. I’m travelling a lot for work again, which I actually adore because it breaks my weeks up and means that I’m not sat at the same desk, in the same office, every day. Mostly, it’s to and from London, and it was no secret that I hated living in London. Absolutely hated it. But travelling down for a day or two each week means that I’m getting the best of both worlds now. I get to see my friends that I made while I lived there and enjoy the ‘London life’, whilst knowing that I still get to go home in 24 hours time. I feel like I’m in a really good place with my job right now, and I’m working towards some personal and professional goals that are pushing me and really keeping me focused, which I guess is the main reason why blogging has taken a back seat for me over the last couple of months - I’ve been giving my all to my career. Do I really want to blog anymore? However, my mind has been thinking about my blog a lot recently. I had the loveliest weekend with Jessie a few weeks ago, and of course we talked a lot about blogging. Jessie and I have been chatting online pretty much since I started my journey into the blogging world 4 years ago. 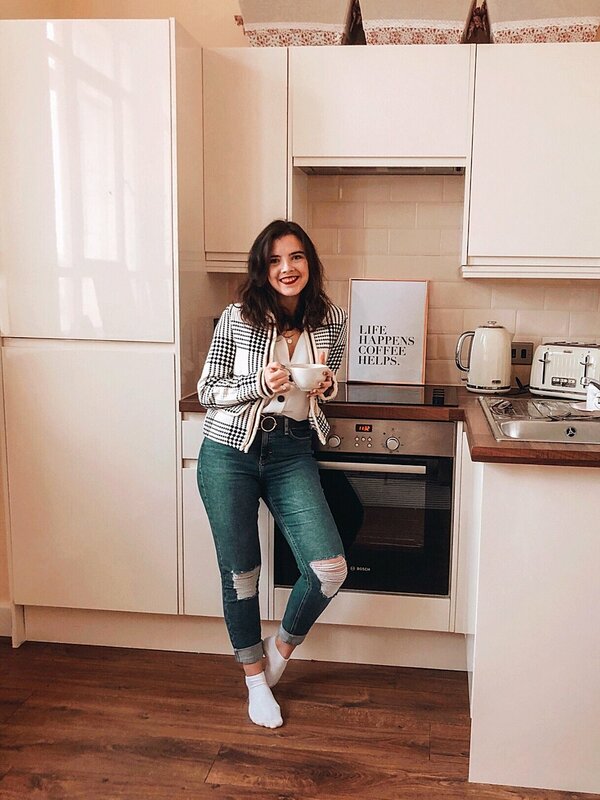 We’ve both watched and experienced the blogosphere change and evolve, and there is no doubt that blogging just isn’t what it was back in 2014. I miss the blogging community of 2014 / 2015. I miss when Twitter wasn’t full of ‘drama’. I miss how much everyone used to comment on each others blog posts. I miss when there wasn’t so much pressure to perform on Instagram. I miss when blogs didn’t have glossy templates and we were all just teaching ourselves how to code a basic blogger.com template to make it look a little better, and all of our domains still contained ‘.blogspot.com’ or ‘.wordpress.com’. I miss the old hobby that it used to be. I’ll be honest, I’ve thought about packing the whole thing in multiple times. I feel like I don’t ‘fit in’ to the blogging community anymore. I don’t want this to be a full time gig. I don’t have the time to invest in shooting editorial photos or for putting in the effort required to grow my Instagram account. All of the photos you’ve been seeing on my blog for over a year have been iPhone photos. I don’t own a DSLR. I’m not talented at make-up and I don’t have the eye for fashion required to be an ‘influencer’. I’m just me. A girl trying to progress her career, navigate the wonderfully confusing (and sometimes confidence-crushing) world of dating, whilst consuming way too much caffeine than is probably good for her already too-high anxiety levels. And then I started flicking back through to some blog posts I wrote when I first started out. Once I’d gotten past the terrible photos and cringe-worthy writing, I started to remember why I used to love blogging so much. I started my blog as a creative outlet. As a place to note down the memories and thoughts that were flying around my head at the time and as a way to connect with like-minded people. Reading back through those old posts gave me such a sense of nostalgia, but it also made me realise how much I’ve changed and how far I’ve come from the girl who felt so lost with life a few years ago. And so, I’ve decided what I’m going to do. I’m going to keep on blogging, but I’m going to go back to blogging for me. I’m going to forget about the numbers and the ‘optimum’ posting times and what everyone else is doing with their blogs. I’m going to go back to documenting my life and my thoughts for me. If anyone else happens to read it, then that’s a bonus, and it’s my pleasure to share these things with you. I want to love blogging again, and I think this is the way I’ll be able to fall back in love with the hobby I started when I was 20 years old (my god!). Mar 3 NO SNOOZING, NO SOCIAL MEDIA! A NEW MORNING ROUTINE THAT HAS CHANGED MY LIFE… A LITTLE BIT.